On Sarah Booker’s suggestion, I set up a page for the Brighton group: places are filling fast for our first meeting on 8 February, featuring developer Simon Willison (behind the Guardian‘s MP expenses crowdsourcing project and wildlifenearyou.com) and the Argus online editor, Jo Wadsworth. So put your name down quickly! This entry was posted in Editors' pick, Events and tagged Add new tag, Argus, brighton, crowdsourcing, England, simon willison, The Guardian, Wales, West Midlands on January 25, 2010 by Judith Townend. The Guardian may be adopting strategies to make itself more Facebook-friendly but the lack of truly local geographical networks on the social networking site makes it more difficult for smaller papers to make great use of it. Just a brief, cursory glance at the Manchester group throws up leads for several potential stories amongst its 500,000 plus members. The ‘See what’s popular’ feature and the discussion board make it a simple place to seed stories as well as one in which to ask for information and pick up leads. But where would you go if you lived in Burton on Trent? Burton is a town in Staffordshire that – if you’ve defining it in terms of Facebook regions – is slap bang between Nottingham and West Midlands. Not much use then if you’re a reporter on the Burton Mail. 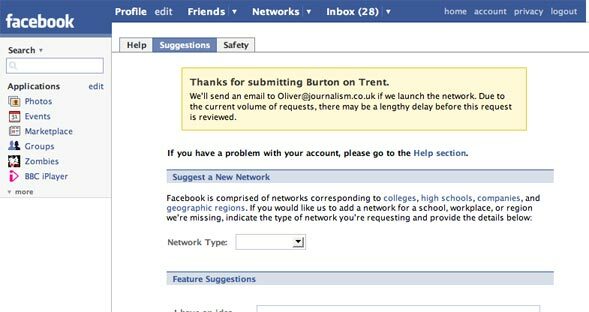 If Facebook gave it’s users the ability to create these networks themselves it would solve a lot of headaches, but don’t expect that to happen in a hurry. So come on reporters on papers in Burton, Derby, Reading, Cardiff, Norwich and the like. Get a campaign going to get your town recognised as a network on Facebook. It can make the day job a hell of a lot simpler. 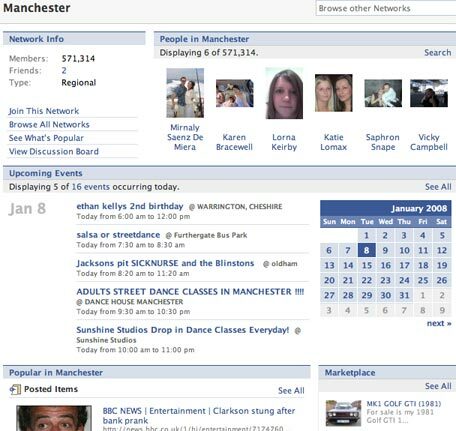 This entry was posted in Citizen journalism, Online Journalism and tagged Burton, Burton Mail, Cardiff, Derby, discussion board, Facebook, local geographical networks, Manchester, Norwich, Nottingham, online community, Reading, reporter, social networking site, The Guardian, the Manchester Evening News, United Kingdom, West Midlands on January 10, 2008 by Oliver Luft.